Vespers (Večernje) service was celebrated Sunday, March 5, 2007, the second Sunday of Lent. Our V. Rev. Milutin Veljko officiated together with V. Rev. Vasilije Tomic and V. Rev. 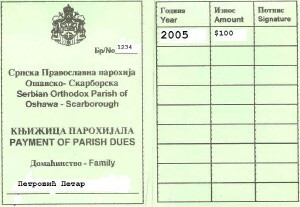 Ljubomir Rajic of St. Sava Church in Toronto, V. Rev. Mihailo Doder and V. Rev. Prvoslav Puric of All Serbian Saints Church in Mississauga, and V. Rev. Zlatibor Djuraševic of Sts. Peter and Paul Church in Oakville, assisted by Deacon Ivan Radovic. Our Bishop, the Right Rev. Bishop Georgije, Episkot Dositej Britansko-Skandinavski, graced our church community. The acclaimed “Kir Stefan Srbin” Choir, under the directorship of Jasmina Vucurovic, accompanied the beautiful and inspiring evening service. Lenten dinner followed the service and was enjoyed by more than eighty congregants and guests. Dance in Folk Group "Sumadija"
Folk Dance Group Sumadija invites all interested children older than 4 to join us in learning the first steps of Serbian dances and tradition through the fun interaction with your peers. Our practices take place every Friday, starting at 7 o'clock. We welcome new members throughout the school year. Become a correspondent and reporter? Send us your text and photos about interesting events. St. Arsenije Sremac Serbian Orthodox Church Choir is in need of expanding its membership and choral sections to include new members who are interested in becoming regular church-goers, with experienced or musically talented voices. They're inviting you to learn to sing the unique Eastern Orthodox liturgical music, in a nurturing and most welcome learning atmosphere. Please contact: Lepa Jankovic at 905-852-4660 , or Svetozar Jovanovic at 905-668-1141. Serbian Language School in Oshawa (E. A. Lovell) has 24 students in ages 4 to 14. The school is on Saturdays, 9a.m. to 11.30a.m. The students learn Cyrillic, Serbian history and geography, and Serbian culture and tradition. Through play, and using attractive and accessible approach, the pupils learn biographies of important Serbs and events that marked history of Serbian nation. Do not forget an annual support (parohijal) - 2005 is almost gone! If you haven't yet done, please, pay $100 in the name of help for normal work of your church school congregation.